Leading Manufacturer of mini table lamp, square zigzag wooden hanging lamp, small zigzag round slitz hanging lamp and zigzag round n slitz wooden hanging lamp from Noida. 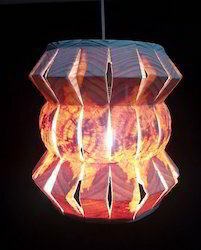 A unique piece of Mini Table Lamp shade with quarter sawn combined with the annual growth rings of the wood. The base looks simple but elegantly turned out. 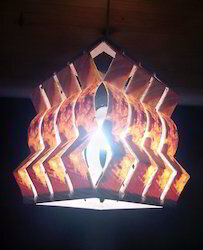 A small Square Zigzag Wooden Hanging Lamp made out of pinewood giving orangish gold hue. The slits can be altered as per customer requirement. We are open to customization. Valued as a reliable manufacturer and supplier, we render the premium quality of products. We offer lamps with resistance against termite, elegant design and eye-catching appearance. Strong logistic support has helped us in delivering the rendered wooden floor lamp within promised time frame. 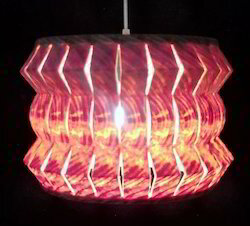 Elegantly designed Small Zigzag Round Slitz Hanging Lamp with slitz inside reflects intriguing mosaic pattern when energized with a warm white LED.